The lineup of the 2015 New Orleans Jazz Fest boasts Elton John, The Who, Keith Urban, Ed Sheeran, Pitbull, Jimmy Buffett, No Doubt, T.I., and Tony Bennett paired with Lady Gaga. 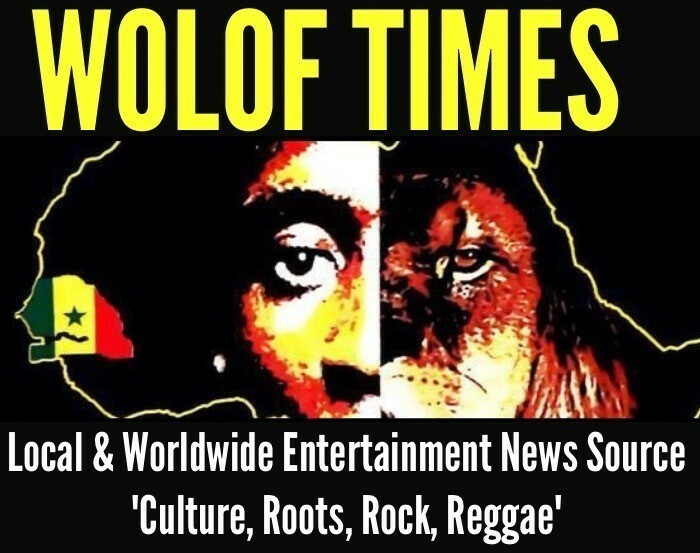 They’ll join a schedule that includes Widespread Panic, Wilco, Maze, the O’Jays, Hozier, John Legend, Shirley Caesar, Alison Krauss, Chicago, Jerry Lee Lewis, Buddy Guy, Steve Winwood, Jimmy Cliff, Ryan Adams and Kacey Musgraves, plus Dr. John, the original Meters and hundreds of other Louisiana artists at the Fair Grounds this spring. 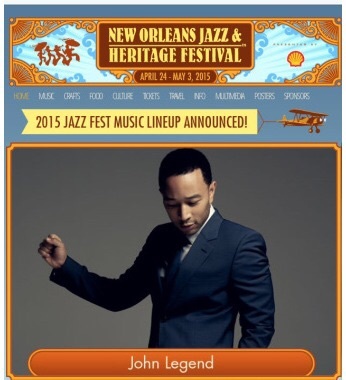 The 2015 Jazz Fest — officially it’s the New Orleans Jazz and Heritage Festival presented by Shell — is April 24-26 and April 30-May 3. 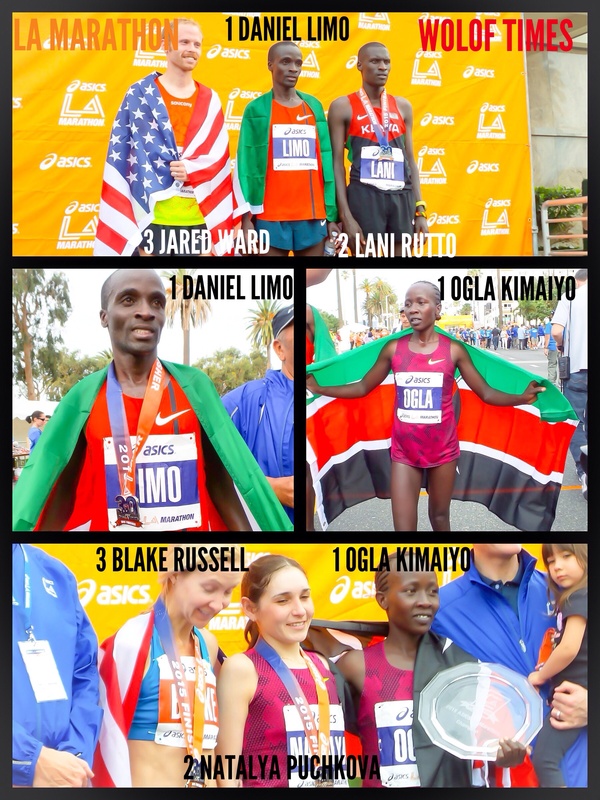 The 2015 LA Marathon was as usual dominated by East Africans as Kenyans won both first and second places in the Men’s category (Daniel Limo, Lani Rutto) and first place in the Women’s (Ogla Kimaiyo). American Jared Ward and Blake Russell did manage to both slip in third places to the delight of the home crowd. Respectable times (Men: 2hr10min, Women: 2hr34min) were set despite the scorching temperature of 96 F and there was great crowd participation throughout the city as this is a charitable event that spans from Dodgers Stadium to Santa Monica. 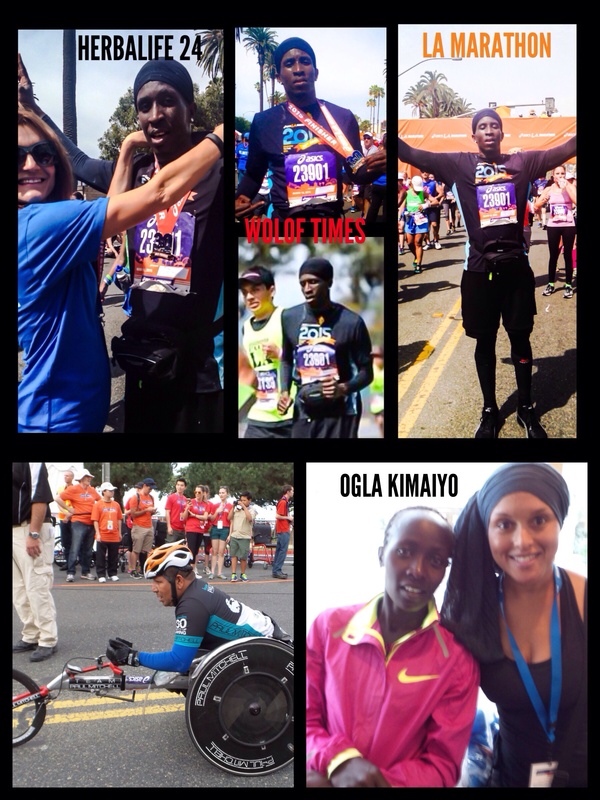 The LA Marathon is a great opportunity for amateur athletes such as myself to challenge ourselves, enjoy the ambiance of the event, sightsee the city of Los Angeles, meet the winners such as Ogla Kimaiyo (Kenya) here with Wolof Times reporter Sunny Moore from Wolof Times, and more importantly contribute donations to organizations such as St. Jude Children’s Research Hospital, Students Run LA, Leukemia & Lymphoma Society etc… via our registration fees. I trained for 5 weeks by running a weekly half-marathon on top of my regular training. I managed to achieve my goal of running 26.2 miles non-stop with a time of 5h11min at an average pace of 11 min per mile, despite a scorching temperature of 96 F. I learnt on my first marathon that running 26.2 miles from Dodgers Stadium to Santa Monica is only achievable for amateur athletes via nutrition and hydration, and also that after 22 miles your overall body muscles are so stressed that there is a high potential for injury. It was a great experience nonetheless and I will forever wear my 2015 LA Marathon Finisher with pride.